Tanitria, is a place of beauty ranging from forests, to mountains, to vast plains. But there is an evil force trying to invade our plane and it will not stop until everything is their own. 2.) All content must be appropriate for all ages... no exceptions. 5.) No bad language. It's just how I grew up and I still stick with it (no swearing, no f-bombs, no crap, no shut up, no "a" words, curses, and no damn or dammit, and other weird variants of the words.) Darn, and shut your door is fine. Any questions on this just ask. 9.) Finish What You Started (I sort of have a rule; if an RP never reaches a conclusion, then it isn't considered canon. There is plenty of good reason for this. Since RPing is a collaborative experience and one where everyone benefits, then it's important to remember that getting involved in an adventure means that that adventure was something everyone's characters went through. If this adventure never reached a conclusion, then that means that everything that had happened was effectively lost or wasted. While RPers have no problem with having a retroactive backstory or continuity, things that don't need an entire RP to have happened, there is something left to be desired when actually taking part in one. 10.) Do Not Play Mary-Sues. Just make sure your character is realistic that they have flaws. No one wants to play with or against a character who is perfect in every way. The vampires of Tanitria hide in plain sight fearing persecution from the rest of the plane inhabitants. They are either Vampire Kor or Vampire Human. These graceful, fearless creatures adventure across Tanitria, looking for unknown treasures. Using their hooks and lines to transverse aerial gaps and ensnare foes, they make excellent guides and protectors. Humans have always lived on the plane of Tanitria though most mingle and with Kor. Intent on wiping out the last traces of resistance from their home (renamed New Phyrexia), these twisted creations believe in survival at any cost. They assimilate the strengths of every race they crush, all in the name of their “Grand Evolution.” Now on Tanitria they plan to take the plane for thier own. Breaking out of his prison, the titan Kellex started to spawn his brood across the plane but at the same time keeping himself hidden. Have an idea or a question about the RP? Then send me a message on this site or contact my me at [email protected]! What is the Blood Cult? : Vampires that want Phyrexian rule. For allegiance what is Grand Evolution? : That means you character serves the Phyrexians. When will we be starting? : When at least several characters have been made. Where/and how are we starting? : In Tanitria's capital city, Farmist. People around the plane are gathering to discuss the rumor of the Phyrexians. Chapters: This RP is kinda thought out we will be starting from chapter 1 every-time a new chapter starts I will post "Chapter 2, chapter 3, etc." once all seven chapters are complete the RP will officially end. You are here to talk about a rumor... but soon trouble comes. Fight your way out of the city. Strike back against the Phyrexians. The entire Phyrexian army have come from the artificial plane of Rath. Rath was an artificial plane utilized by the Phyrexians as a staging point to invade Dominaria. Created out of flowstone generated in the central Stronghold, the plane slowly expanded over centuries until it was the same mass as Dominaria itself, at which point it would transpose atop the target plane, carrying its armies directly into the field. As Rath grew, regions of the two planes would overlap briefly, bringing Dominarian inhabitants into this new, hostile environment. Rath was ruled as a Phyrexian fiefdom by appointed evincars, though an effective uprising was led by Eladamri just before the planar overlay. You weren't doing what you thought you were. The great wizards of Tanitria prepare a spell that will end the conflict. Appearance: Pale, black eyes, black short hair (buzz cut), short 5' 3"
Personality: Boastful, can be mean to people. 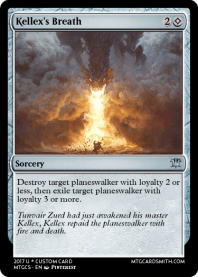 Planeswalker (Yes or no? If yes choose any of the colors) white, blue, black, red, green, devoid: Yes. Blue and black. Bio: From Zendikar, trained to be a hunter. His Planeswalker spark ignited now he travels the multiverse and fights evil. Other: Likes any type of soup. Personality: Calm, relaxed, she seems composed but secretly on lookout all the time. This character will appear later in the story. Weapons (Two weapons only): Doesn't use mortal weapons. Appearance: Averagely sized and built for a Zendikari Kor. She usually wears a dark cloak to pass as a human. Personality: She speak very little, and prefers a tree over a human. She is generaly full of wanderlust. Planeswalker (Yes or no? If yes choose any of the colors) white, blue, black, red, green, devoid: Yes; Aylora is a Conjurator, or a mage of summoning forces two her will. Usualy these are natural. Her colours are white and green. Bio: She's from Ondu in Zendikar. Her spark ignited at the sight of Emrakul itself. This plane was her first walk, and she has not yet discovered how to travel planes at will. Weapons (Two weapons only): Typical kor hooks. Other: She has a strange liking for bacon, the sad thing is, pigs are her favorite animal. @Gelectrode I think they mean generic evil. Like, Ob Nixilis or something. Appearance: He is a very tall person, coming in at around 6' 4"(193 centimeters) and is dressed like your average combat capable resident of Innistrad, with a very large coat consisting of grey fabric, and keeps a head of trimmed brown hair under his tricorn, as well as being clean shaven. Personality: He is willing to do anything to take vengeance on someone he believes has wronged him, and doesn't easily trust anyone else, believing that trust is a tool to be exploited, and nothing more. Planeswalker (Yes or no? If yes choose any of the colors) white, blue, black, red, green, devoid: Yes, BR. Bio: Hailing originally from the plane of Innistrad, Galloran had been raised for a role as a cathar since childhood, and is more than capable of combat. After approximately three months of serving the church, his spark ignited when he witnessed the slaughter of those he worked with, killed by a group of Falkenraths. He was whisked away to a plane unknown, only to arrive to Tanitria a couple years later. In his time unrecorded, he's grown cynical and distrusting, choosing to only watch out for himself as he harbored his grudge. Seeing a chance to wipe out members of the vampire race, he has chosen to ally with the Phyrexians for the time being, if only to feed his desire for revenge. Weapons (Two weapons only): He carries a rapier with him at all times. Other: He has a surprising sweet tooth. Appearance: Like a skeleton wearing a thick hoodie and a long baggy trousers, with a pair of black boots. Personality: Easy-going, with hidden intentions beneath his facade, probably. But he's actually a nice person, he never kills unless it's necessary. Planeswalker (Yes or no? If yes choose any of the colors) white, blue, black, red, green, devoid: Yes. Blue-black. Creature Race (Vampries, Kor, Humans, Phyrexians): Formerly human, now he's a wandering skeleton. But still, human skeleton. Allegiance (Tanitria, Grand Evolution, Blood Cult): None. Bio: Hailing from a plane which technological level is roughly same as ours but the magic there is also common occurences too, Yas-Naja was a simple worker with an average, alone life. When he was finally growing old, he took a pact with a demon who specializes in necromantic magic due to his deadly sickness. In the end, the demon made him a phylactery for his soul and he became immortal, but with the cost of his servitude (and his skin) to the demon. Then the fight between him and the demon occured due to the interference of his inner planeswalker power and the demon's binding spell. Nearly whisked away to oblivion by the demon, his spark triggered and he finally escaped to another plane along with his phylactery. After years of wandering throughout the multiverse, he finally went to Tanitria just because of a random planeswalking. Weapons (Two weapons only): His magic. No apparent physical weapon. Other: He looks like a skeleton, so average people would normally afraid of him. So he has to talk it out to the nearest authority that he has no bad intention. Due to years of training with many other mages across the multiverse, he becomes an adept in necromancy and illusion magic, and even also a little bit temporal magic too. "Hmph, if I can ever eat again, I would devour a whole pig, grilled with barbecue sauce just because for its taste." "I suppose that that's considered as a great delicacy in your homeworld." "You don't know kid, you don't know." @akarih, @Amaster123567, @Ka-boom360, and @Arcanemage would love this. They love D&D and other related games. I think it's humorous when someone's username can't receive tags due to special symbols. @Ka-boom360 lol. Yeah your right. @CheapQuester these are early days and I hope more people join. Appearance: Average size for a female teen; wears tight red robes for maximum manoeuvrability/ no "physical" armour. Personality: Usually quiet and laied back, but when the need arises, she is very quick to make action. Likes her odds when gambling, even life-threatening situations. Enjoys picking at other peoples mana, especially when she gets a reaction from them. Creature Race: Human, sister to a human with almost God-like power. Bio: Originates from the plane of Holmfirh. For years Holmfirh with ruled by Hennerson who was obsessed with control by power. 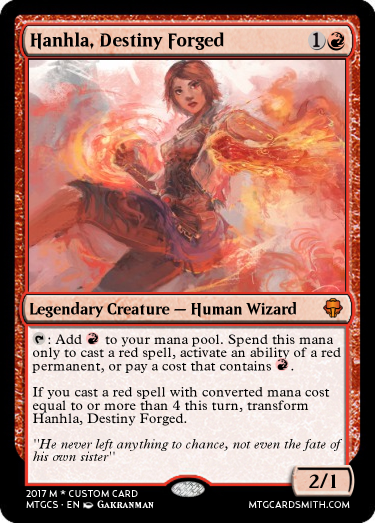 When his sister Hanhla finally decided against her set fate, she managed to pluck at mana between his spells, banishing him but causing her great stress - which ignited her spark. As Hennerson's magic wore off, Holmirh's vast landscape began to reshape; many of the creature that had been locked away now aid Hanhla in her endeavours. Weapons: Pyromancy and using other planeswalkers mana against them. Tanitria's capital city Farmist was built in one of Tanitria's many plains. People of all classes poor and rich were gathering at the palace where they would discuss the rumor from a few villages north about the Phyrexians. Some people thought them just a rumor, some thought they were spirits, others like Randex thought they we're invaders from another place. Randex, had been adopted by one of the rich families. Here on Tanitria people who had more wealth than others had the power in these "meetings" he stepped out of the alley way he was in into the sun. The sun stung him, being a Vampire he needed to be careful because the Kor and Humans of Tanitria hate Vampires. Randex, had only revealed where he truly was from to the man who adopted him, he came from a plane called Zendikar. Randex wore a white cloak, white boots, and white hood all the white was for going against the sun's heat. Venye, traveled down one of the roads to the palace, she could see a boy probably about her age dressed in all white. The first word that popped into her head was odd. She quickly dismissed that thought continuing toward the palace bunch of other people moved toward the palace. Personality: Adventurous and brave, but isn't used to interacting with others. Bio: Born on Zendikar, some of his grandparents were planeswalkers from Dominaria. 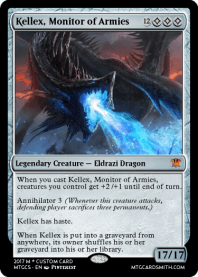 He was raised during the eldrazi apocalypse, but his spark ignited during the final confrontation with the 2 titans. He has learned many spells on his travels, and is very skilled at combining or creating spells. Weapons: He uses an all-purpose multi-tool that can take on almost any form, but is limited by the mana he has access to. It is made from a small hedron shell, and it is also used as a mana battery. He usually uses it as a sort of grappling hook or a crossbow. @CheapQuester are we going to start soon. I believe it's around 12pm for you now. @CheapQuester soz, thought it was maybe just some more character lore. Could you maybe put some bold or large text above it to show the chapter and/or what should be done in it? Galloran slips in among the crowd, taking care to stay away from anyone dressed to the point that barely any sun reached them. He had a sneaking suspicion of what the discussion may be, but kept quiet and kept his head down, not wanting to cause a stir, especially in a very public place such as this. An odd figure walked in an alley of Farmist. Hands in pockets, he wore thick clothes to the point were other people could only see his face. His grey puffy hoodie also seemed to be out of place due to the difference in tech developmental level between his homeplane and the plane he currently resides. Yas-Naja was annoyed because of his lack of direction of that place. But it was a good thing that he cleared everything before in the local authority about his rather "undead-ish" appearance. Even if they would never accept him, he could do some of his mind tricks to them. A nice perk of being a blue-aligned wizard. Though he wasn't a master in the mind manipulation, that usually enough to persuade a common person just to accept him in the said person's domain. 'Welp, should took a goddamn map before.' He monologued telephatically. The downside of being had no flesh or inner organs. Telephaty had become his second nature due to his lack of vocal cords and lungs. A slightly costly way of communication due to using a bit of his mana, but its either that or no voice at all. After walking for a while, he then saw a lot of people went in the city's palace. The local authority before said that there was a rumor about the Phyrexians, that they would come to invade that world he currently resided. In the distance, he saw a person cloaked in white clothing went into the palace. 'Probably just a local filthy rich guy.' He thought. After a while thinking, he finally decided to went inside the palace. Short distance teleportation, or just 'blink' was a neat trick he learned from a crazy Izzet mage in Ravnica. Well all Izzet mages were crazy anyway. By tapping a little bit of his planeswalker spark and combining it with blue mana, he could just blink in and blink out in an instant to another location and not feeling tired, although the distance was just a few kilometers at maximum. A bit different with 'dispersion' technique that widely used by blue mages that they used to make objects vanished from the thin air. And just like that, he just strode into the palace along with the others unconspicuously. Randex, was one of the first nobles to get into the palace. They were hosting the meeting in the throne room, though there was no king and queen of Tanitria for several years now because of assassinations, and or illnesses. The throne room was huge rectangular shape and they had set up a hug circular table. Instead of sitting at one of the 24 chairs at the table, Randex sat down near both of the throne chairs against the wall. Many other people would also be sitting or standing. When one of the 24 people were done talking they would switch out with someone else in the crowd. No one dare touch the king and queen chair's it was said ancient magic guarded it that only people of royal blood could touch it. If someone tried to the person would die instantly. Randex, didn't have the time and didn't want to find out if the legends were true. He looked down at his hands taking off his white gloves he didn't need them in here, they weren't opening up any windows today. He moved his hood back so it wasn't covering his face. Revealing his black hair. Which was unusual in most eyes because the Humans on this plane had either had brown or blonde hair. Rarely black. Then again he is a Human from Zendikar. He barely remembered his home, a man's voice broke his thoughts the dude had shouted they were about to begin. Venye had been waiting for a group of the crowd to pass by so she could continue she wasn't the one to force her way through. The crowd cleared a little and she slipped into the crowd just to bump into a young man (Galloran) she made a quick apology before continuing on her way. Making her way into the palace. "I'm kinda starting to enjoy this" thought Hanhla as she weaved a beautiful pheonix with her pyromancy. Hanhla had been aimlessly jumping planes trying to find something "fun" to do when she tumbled upon Tanitria. The place seemed pretty nice with it's rolling his and cloudless night skys, and after wondering around a bit, she had found a great gathering of people near a city palace; this a perfect time to gain a little of this planes currency as she loved to see what spirits (alcohol, not ghosts) diffenent places had to offer. In the past, Hanhla had found she had the power to tap into other planeswalkers mana, creating lovely coloured displays, even if it did annoy said walker a little. Before coming up to do some elemental creations, Hanhla had experimented with what mana she could find in the area; there were a lot of planeswalkers here, using lots of diffent colours, but this didn't bother her too much - she knew how to defend herself after all. Does anyone want to look particularly p*ssed at me (Hanhla) while I do some entertainment pyromancy on a stage near the palace? Or even let me pick them out of the crowd, pick on there "inner" mana and create coloured fireworks out of it? @Blazin_Biscuit OOC: Oh, pick my character! He's immortal. He also already anchored his soul to an object he's currently hiding somewhere anyway.